Keep your eye on dopamine: drugs used to treat Parkinson's may also be helpful in treating diabetic retinopathy. Researchers test vision in diabetic mice by assessing whether they can follow a pattern of lines projected around them. Dopamine-restoring drugs already used to treat Parkinson’s disease may also be beneficial for the treatment of diabetic retinopathy, a leading cause of blindness in adults, researchers have discovered. The results were published recently in Journal of Neuroscience. "There was some evidence already that dopamine levels were reduced in diabetic retinopathy, but what’s new here is: we can restore dopamine levels and improve visual function in an animal model of diabetes," says Machelle Pardue, PhD, associate professor of ophthalmology at Emory University School of Medicine and research career scientist at the Atlanta VA Medical Center. The first author of the paper is MD/PhD student Moe Aung. Senior authors are Pardue and P. Michael Iuvone, PhD, professor of ophthalmology and pharmacology and director of vision research at Emory Eye Center. Aung and his colleagues examined mice that were made diabetic by treating them with streptozocin, which is toxic to insulin-producing cells in the pancreas. By injecting the mice with L-DOPA after they received streptozocin, the researchers could delay the appearance of visual problems by weeks and lessen the severity of the visual defects. Researchers also found that the visual benefits of L-DOPA originated from the retinas, since treatment improved retinal responses, as measured by electroretinography, to levels similar to control animals. 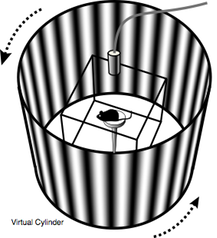 Vision was assessed by putting mice on a platform and measuring whether they moved their heads in response to a rotating pattern of vertical lines projected on a cylinder around the mouse. The fineness and contrast of the lines can be modulated to test the mouse’s vision. L-DOPA, a precursor to dopamine, is part of the most common drug treatment for Parkinson’s disease. The symptoms of Parkinson’s (tremors and movement difficulties, as well as disturbances in sleep, digestion and cognition) are caused by the death of dopamine-producing cells in the brain. L-DOPA is usually combined with carbidopa to combat side effects and increase uptake in the brain. The researchers also measured the effects of other dopamine-related treatments on visual function. Dopamine receptor agonists – drugs that mimic the action of dopamine – are sometimes prescribed for Parkinson’s patients who do not respond to L-DOPA. Neurons and retinal cells have several molecules that enable them to respond to dopamine, and individual drugs affect them to varying degrees. Working with Iuvone, MSP graduate student Chad Jackson, now at Vanderbilt, found that giving diabetic mice dopamine receptor agonists that acted on the receptor D1R improved the ability to see fine lines (acuity), while drugs that act on D4R improve contrast sensitivity. "This is important because it shows that treatments targeting dopamine could be beneficial to patients with established diabetes," says Iuvone. "It should be straightforward to try L-DOPA or dopamine receptor agonist treatment in adults, although L-DOPA could have complications in children. Bromocriptine, a dopamine receptor agonist, is already FDA-approved to treat type 2 diabetes. It will be important to determine if the same dopamine receptors modulate acuity and contrast sensitivity in humans." The research was supported by the National Eye Institute (P30 EY006360 and R01 EY004864), the National Institute of Diabetes and Digestive and Kidney Diseases (DK07601-01), the Department of Veterans Affairs, Research to Prevent Blindness, the Juvenile Diabetes Research Foundation and Children's Healthcare of Atlanta. Reference: M.H. Aung et al. Dopamine Deficiency Contributes to Early Visual Dysfunction in a Rodent Model of Type 1 Diabetes. J. Neurosci. 34: 726-736 (2014).